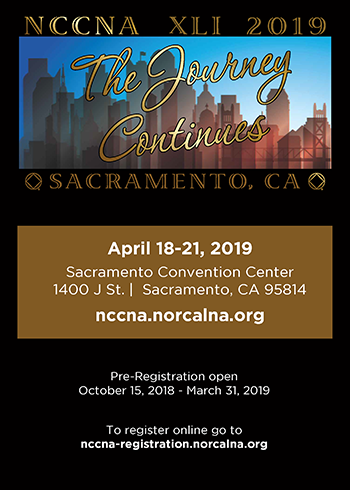 When the Northern California Region of Narcotics Anonymous made the decision to hold an annual convention, the Northern California Convention of Narcotics Anonymous was formed. The first convention was held in 1979, in San Jose, California. There were approximately 350 addicts in attendance. From the time of that first convention, the Northern California fellowship of Narcotics Anonymous has continued to grow, expanding to the 23 areas that now represent the Region. This celebration of unity, known simply as NCCNA, hosts between 6,000 to 8,000 addicts annually. At the convention there are Marathon, Topic, and Speaker Meetings as well as Workshops. Other activities are available, such as dances, concerts, and other forms of entertainment. 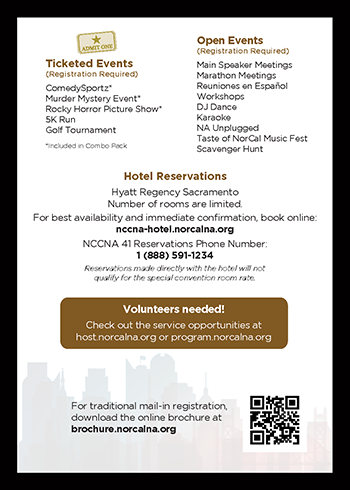 For more information contact the NCCNA committee.